They harnessed the technologies, taught others and or help recover history. The ODA Hall of Fame honors them for their contributions to the metal detecting industry, their ingenuity, their courage, and their vision. 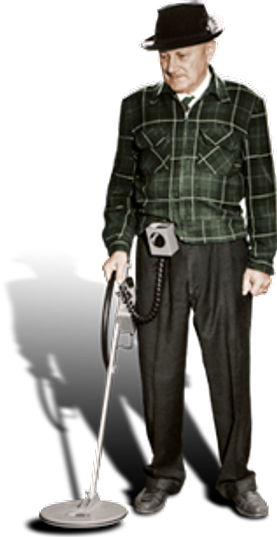 (1) Fisher Research Labs was founded in 1931 by Dr. Gerhard R. Fisher, the world renowned engineer and inventor who was the first to receive a patent for the metal detector. From its simple beginnings in Fisher’s garage, Fisher Research Labs is a made-in-America success story. The world’s oldest metal detector business, Fisher Labs uses the latest in technology to build the most trusted products in the industry. Dr. Fisher, a German immigrant who studied electronics at the University of Dresden, was a Research Engineer in Los Angeles in the late 1920s when he obtained the first patent ever issued for aircraft radio direction finders. His revolutionary work in aviation attracted the attention of Dr. Albert Einstein. After seeing a demonstration of Fisher’s equipment, Dr. Einstein predicted the worldwide use of radio direction finders in the air, on land and at sea. Aircraft pilots who used Fisher’s early navigation tool found errors in their bearings when metal objects came between the transmitter and receiver, or whenever they passed over certain terrain. Dr. Fisher determined the errors were caused by the presence of highly conductive, mineralized substances. This discovery led to his invention of a portable electronic prospecting instrument, based on the same principle, used to detect the presence of buried metal objects and ore deposits. In 1931 Fisher founded Fisher Research Labs in his garage in Palo Alto, Calif. He and four employees produced the "Metallascope," a rugged, easy-to-use metal detector. By today’s standard of lightweight handheld detectors, it was an ungainly device with two large, flat wooden boxes containing simple copper coils, five vacuum tubes and a few assorted components. The Metallascope soon captivated the imagination of the country, and within a short time, the world. Around 1933, the U.S. Navy hired Dr. Fisher to install a radio direction finder aboard the dirigible, the USS Macon. It was aboard the Macon that Dr. Fisher discovered that large metal buildings and mineralized mountains blocked his navigation device’s direction finding capabilities. With the increasing popularity of the M-Scope, and with Fisher’s patent rights expiring, numerous competitors began producing similar detecting equipment. Through its relentless efforts to incorporate the latest technology into its products and by applying the vast field experience of its users into the design of new metal detectors, Fisher Labs led the industry into a new era of detection technology, capability and products. Over the years, Fisher has designed and produced such sophisticated products as Geiger counters, radio communication systems, voltage detectors and cable fault locators. In 1961, Fisher Labs moved again to an even larger production facility in Belmont, Calif. By the time Dr. Fisher retired in 1967 his name and work had left an indelible mark on the electronics history. The company continued to grow, and in 1974, Fisher Research Labs moved to Los Banos, Calif., where it resided until 2006 when it was acquired by First Texas. (1) During the uranium scares of 1950, many people were interested in searching for radioactive elements. Kenneth and Olive White were among these pioneering explorers. 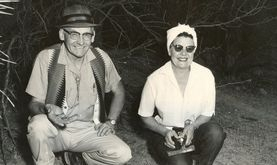 Kenneth Sr. and his wife, Olive. (1) Charles Garrett, founder, president and chief executive officer of Garrett Metal Detectors Inc.
A resident of Garland, Garrett grew up in Lufkin and graduated from Lamar in 1959 with a degree in electrical engineering. Garrett had a passion for treasure hunting, and his desire to create a better metal detector resulted in a business whose impact is felt around the world. 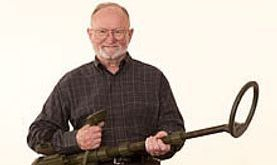 The company he and his wife, Eleanor, began in 1964 as Garrett Electronics has grown into the world’s largest manufacturer of virtually all types of metal detection equipment. Their metal detector business began modestly. With $1,000 they had saved, the couple purchased enough parts to build 25 new instruments and placed an advertisement in True West magazine. They offered two versions of the first Garrett metal detector: the “Hunter” and the “Sidewinder.” The first $145 “Hunter” went to a mail-order buyer from California – and Garrett Electronics was born. From his first experiences with “treasure” as a child – burying a small container of old clothing buttons under his boyhood home in 1939 – to his first real treasure find – a gold watch and several coins unearthed in 1948 – the idea of buried treasure fascinated Garrett. After graduating from Lufkin High, he enrolled at Stephen F. Austin State University to study forestry, but college was soon interrupted by service as an electrician mate in the Navy during the Korean War. The next summer, he married Eleanor Smith, who earned her bachelor’s and master’s degrees from Sam Houston State University. Soon, the couple moved to mid-Jefferson County, where she began teaching school and he enrolled at Lamar State College of Technology to study electrical engineering. While at Lamar, Garrett worked part time for the Texas Highway Department in its soils laboratory, gaining knowledge that would prove beneficial in metal detection. He also credits his training at Lamar “from top-notch professors” as a great aid in his career. He and Eleanor honored one of them when they established the Professor Floyd Crum Scholarship in Electrical Engineering in tribute to the professor who had inspired him during his years as a Lamar student. The couple also established both the Charles Lewis and Eleanor Smith Garrett Scholarship in Engineering. In addition, Garrett contributes to his alma mater as a member of the College of Engineering Advisory Council. After graduation from Lamar, Garrett moved to Dallas and a position as a circuit designer for Texas Instruments. In the early 1960s, the young engineer helped develop military specifications for TI’s space electronics division, including a power supply for the Mars Mission Mariner 2 Spacecraft and electronic flight scanning templates and controls for the terrain clearance radar of the F-111 aircraft. He joined Geotechnical Corp. in nearby Garland in 1962. He took his detectors into the field, spending countless hours learning how to use them effectively. This practical experimentation led to refinements that, over the years, gave the company an edge over its competition. Garrett has acquired several patents for innovative equipment and features, beginning in 1982 when Garrett Electronics was awarded the first U.S. patent for the use of a computer chip in a metal detector. “When we entered the metal detector ‘industry,’ it was far from established; there were scores of small companies, each claiming to produce a detector that would ‘hunt deeper,’” Garrett said. He set out to not only create a superior product but also to provide factory support and first-rate customer service. It was the right formula. Of the more than 100 metal detector business that have started up since the Garretts have been in business, only a handful remain. It is hard to go to any public place – courthouse, airport or other building – and not see the Garrett name emblazoned on a security detector in its trademark, eye-popping yellow. The effect of Sept. 11, 2001, on the company was dramatic as sales of Superscanners and walk-through detectors quadrupled in one day. Garrett has served as president of both the American Metal Detector Manufacturers Association and the International Treasure Hunting Society. He has authored more than 20 books in his field of expertise and has sold more than a million copies. As a hobby, he collects and restores antique cars.